Even before we knew about Them, They existed in some form. The world did not BECOME round when sailors discovered other unseen lands, right? The Law of Gravity did not begin to work AFTER you understood it. WE have only changed in our ABILITY to “see” or measure or utilize them. Salmon and other fish, butterflies, most birds, oysters, bats, sea turtles- just about any animal– survive by using Frequencies to find “Home” or to find Nourishment. 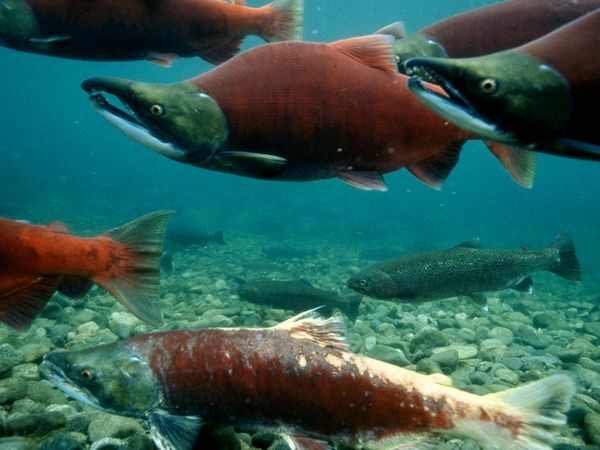 Do you think salmon call it Vibrational Frequencies, or Magnetic Polarization, or do you think it’s just something they feel? I doubt they understand the mechanics of it as we do, yet they ALLOW AND USE those “feelings” in ways we only dream of. When was the last time YOU correctly navigated thousands of miles, or flocked with precision movement in a group of thousands using just your Feelings, or found dinner with just your sense of smell or hearing? (Well, OK, maybe we’ve managed that one.) Animals- they merely listen, they tune in to the various energy frequencies that exist, and thrive by using them. They don’t spend their lives debating How they work, what it’s called, IF it exists, who has the RIGHT perception of it, etc… and yet they live and use it successfully. Are we so stuck on LABELING the same energy that we forsake the ABILITIES to use it? This planet is held in it’s very location and survives because of Energy Frequencies. WHY WOULD WE HUMANS BE ANY DIFFERENT? As Deepak Chopra points out in “Quantum Healing”, if you put iron filings on one side of a paper and a magnet on the other, you can make the iron filings dance “by themselves”. You’d swear they were alive if you didn’t KNOW about the magnet. Do you think Fish and other Animals Understand about Magnets? Or do they just FEEL? SOMETIMES IT IS BETTER to not spend your time trying to explain, or trying to agree on How to Label the magnet. Simply enjoy the dance they can provide.